Block the sun but keep the open air experience with a ShadeMaker Mesh Bimini top from MasterTop. 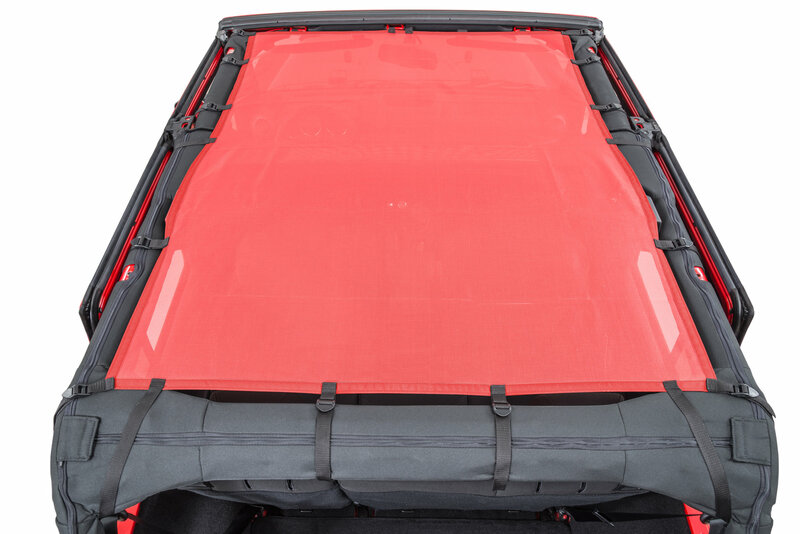 These easy to install tops attach to the sport bars of your Jeep with straps and buckles providing protection from the sun for you and your passenger. No header channel or tools required to install! ShadeMaker tops are constructed of extra durable commercial grade mesh fabric originally developed for over the road trucks to protect cargo from flying out of the cargo space. The added benefit of this durable mesh is its ability to block up to 70% of the sun’s harmful UV rays. All ShadeMaker Mesh tops encapsulate heavy duty webbing on the edges to provide the most durable attachment points found in any mesh top design. Install this top and forget it! It is always there when you need it most. 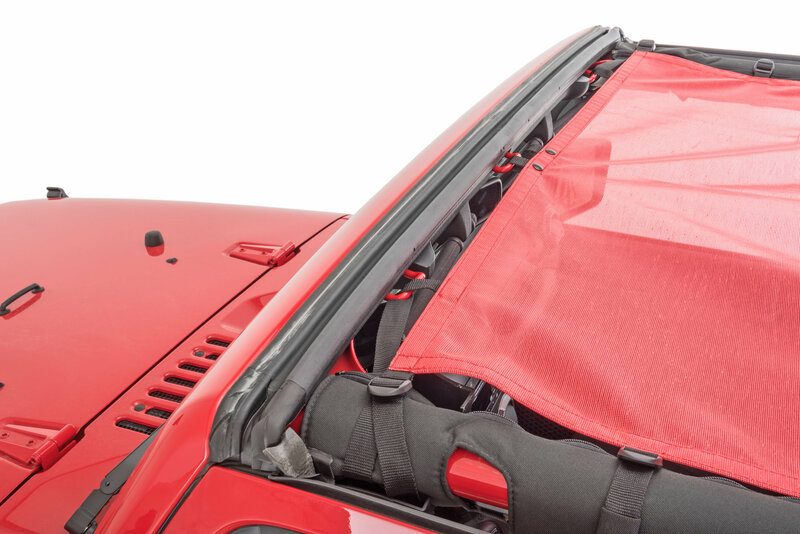 Available in both black and red mesh, these tops are a must for any Jeep owner. Note: Top must be removed before re-installing your hardtop. 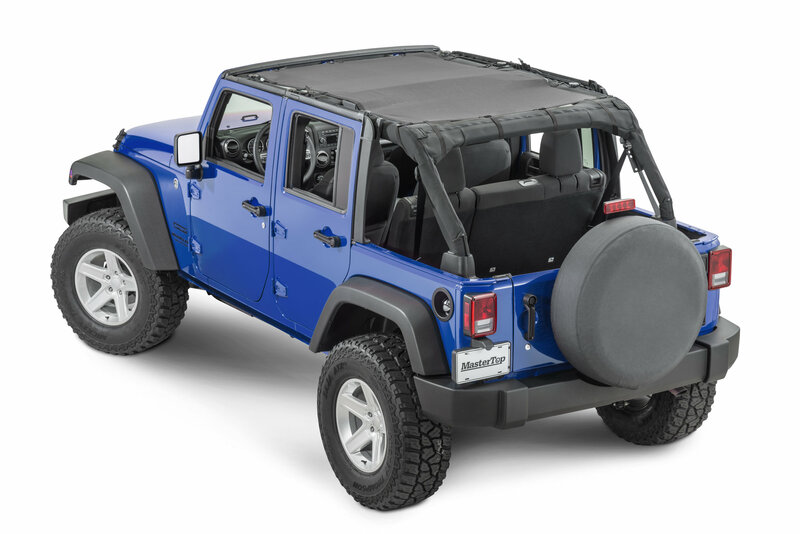 If you wish to leave the ShadeMaker Mesh Top on when re-installing the hardtop, please see MasterTop Freedom Mesh Tops for JK Wrangler. Heavy duty material and is goes on easy. I leave it on when I put my hard top back on!! No problems at all!!! Great product!!! I used it twice and the buttons on the front fell apart. It doesn't appear in the photos that there is access to the L-handles on the freedom top panels nor is there holes for the screw tighteners to go through to tighten the panels down. Is this compatible with the freedom top style hardtop on a 2008 JKU? Hello, there are no holes for the Freedom Panel knobs. You will need to undo the straps for the mesh top and pull it out of the way to install the knobs. Thank you for your question.